Saundatti, also known as Savadatti, is a beautiful town in the Belgaum district of Karnataka and is popular amongst locals and other seasonal tourists as a pilgrimage centre. Hence, it is home to several temples and other religious sites. But do you know there is a lot more to savour here? As it dates back to the early Medieval Period of India, it is home to several ancient sites and historical places. One such site which remains unexplored throughout the year is Saundatti Fort. On account of its interesting history and beautiful surroundings, it should be visited by every traveller, especially history lovers. 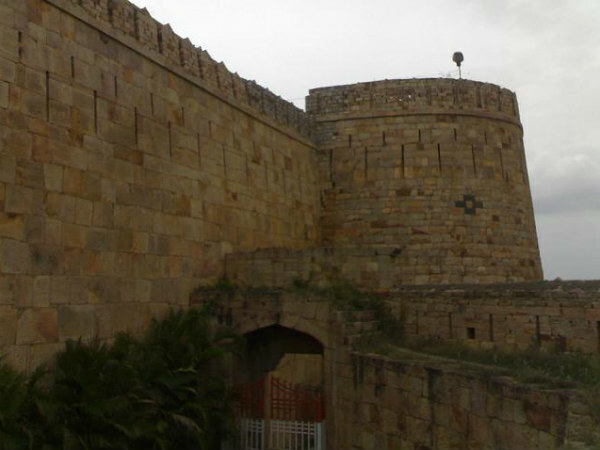 Read on to know more about the history and surroundings of the fort and how to reach it. With a tropical savanna type of climate, the region of Saundatti experiences a pleasant climate throughout the year, and hence it is a year-round destination. However, if you desire to avoid the summer heat of Saundatti, then the best time to visit it is from September until the end of February. During this period, the weather is cool and favourable. Saundatti Fort is located atop a small hill and is said to have been built by Jayappa Desai in the early 18th century. However, later on, the fort was captured by Hyder Ali of the Mysore Kingdom. Surrounded by a large moat and built in the shape of a nine-sided polygon, this age-old fort was one of the strongest forts in the region. Today, the fort is a tourist destination in Saundatti and is visited by hundreds of locals and history lovers every year. Kadisiddeshwara Temple, located in the centre of the fort, is a major attraction here. Recently, a new temple dedicated to Lord Hanuman has been built inside the fort. With beautiful carvings, commendable architecture, strong bastions and tough walls, it is one of the most beautiful forts in the region. From the top of the fort, you can enjoy the panoramic beauty of the settlement of Saundatti. If you have been looking for an offbeat weekend destination around Bangalore or in Karnataka, then you must add this beautiful age-old fort to your list now. As it is only popular amongst locals and a few offbeat travellers, you can explore its beauty comfortably without any disturbance from the tourist crowd. You can also visit its nearby attractions which include temples, natural places and other historical sites. The list includes Renuka Lake, Puradeshwara Temple, Ankeshwara Temple and Yellamma Temple. So, what's your take on Saundatti as a perfect weekend getaway now? By Air: As Saundatti doesn't have an airport of its own, you need to take a direct flight to Belgaum airport. Once you have reached the airport, you can either hire a cab or catch a bus to Saundatti. The distance between Belgaum and the fort is 95 km. By Rail: The nearest railhead to Saundatti is located in Dharwad at a distance of about 45 km. From the railway station, you can either catch a bus or hire a cab directly to Saundatti. By Road: Saundatti is a developed town, and hence it has a good road connectivity. Therefore, you can easily access the fort by road.